Microsoft held their Surface event to day and it turned out to be quite the reveal. Not only did they announce a whole slew of creation-centric additions coming in the next major Creators Update to Windows 10, they also unveiled their first AIO PC. The Surface Studio is perhaps a slight homage to the iMac, but with more potential under the surface. Th new device is aimed squarely at the creator in all of us, as Panoy was eager to point out. We’re all creators in some may, and the Surface Studio is meant for those wishing a method of interacting with your works in a more natural way. One of the big selling points the 28-inch touchscreen that houses 13.5 million total pixels, a resolution of 4500 x 3000, with DCI-P3 and full sRGB color support. Of course, it also has support for the much refined Surface Pen, included, that allows you do use it as a giant canvas. In essence, it’s like a Wacom tablet, though with far more functionality. The 163-PPI screen should allow for great, detailed work to be done. The Surface Studio is already listed as available for pre-order today and starts at a lofty $2,999 for a 6th-generation Intel Core i5 processor, 1TB of internal storage, 8GB of RAM and a 2GB 965M GPU. $500 extra will gain you a model with a more powerful Core i7 CPU and 16GB RAM. At the top-end, the Surface Studio will cost $4,199, with a Core i7 processor, 2TB of storage, 32GB of RAM and a 4GB NVIDIA GeForce 980M graphics card. According to Microsoft’s site, the Surface Studio is scheduled to ship on December 15th for the initial pre-orders. Just remember that this isn’t necessarily being marketed towards those wishing for a pretty computer to fill their desk up. 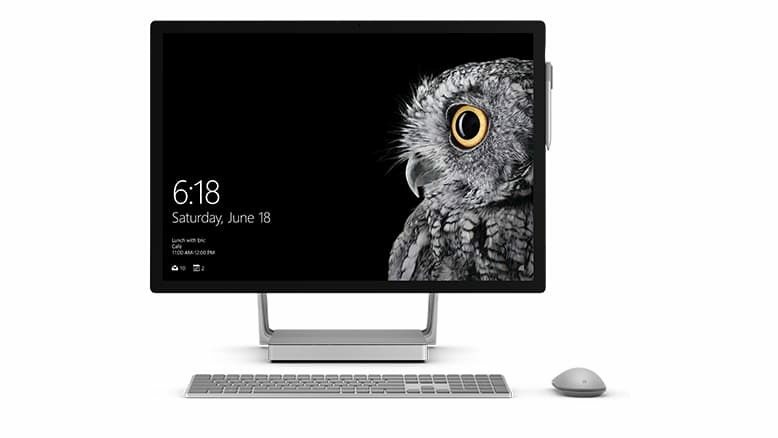 The Surface Studio is designed for those that will most make use of the features it has, the touch screen, pen, and the fact that the hinge can make it easier to work on. It’s also possible to use the Surface Dial, which is a wireless aluminum dial, puck-like, that can give an additional degree of manipulation. On the whole, the concept appears to be well-thought out, with a “zero-gravity” hinge designed to make it seem weightless when moving the screen around. For artists, motion graphics and more it could be a useful device. But the limited, non-upgradeable components might be a limiting factor when choosing a new system to create on. If anything, it looks damn nice though.